The MT3H-0113H is a triple balanced passive diode mixer offering high dynamic range, low conversion loss, and excellent repeatability. As with all T3 mixers, this mixer offers unparalleled nonlinear performance in terms of IIP3, P1dB, and spurious performance with a flexible LO drive requirement from +16 dBm to +24 dBm. RF, LO, and IF ports are all operated single ended due to integrated baluns. The MT3H-0113H is available as a wire bondable chip or an SMA connectorized package. 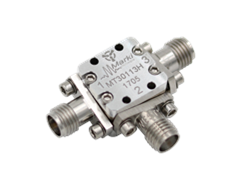 The MT3H-0113H is a superior alternative to Marki Microwave carrier and packaged T3 mixers.